For those who have not seen a Fire Polish diamond in person, the amount of sparkle, fire and brilliance given by each diamond is truly special. In order to create a diamond whose sparkle is unmatched by traditional cutting techniques, Fire Polish Diamonds utilize Fire Prism TechnologyTM, a method which allows them to cut thousands of Nano Prisms into naturally mined diamonds increasing their overall Beauty QuotientTM.Also known as light performance, Beauty Quotient is the quantifiable combination of sparkle, fire and brilliance in a diamond. 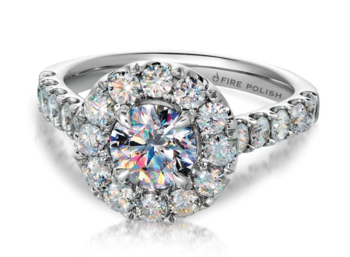 Today, Fire Polish has announced it will be expanding its line of engagement rings to also include melee stones in their designs. The difference in sparkle is said to be something retailers and customers alike will â€œneed to see to believe,â€� and diamond aficionados will be able to do just that as the new product will be on display at both the AGS Conclave and JCK Las Vegas this year. The term â€œmelee diamondsâ€� refers to round cut diamonds that generally weigh under .10ct. The addition of these lightweight diamonds onto Fire Polishâ€™s engagement rings has dramatically increased the overall beauty of the pieces. Now decorated with these melee diamonds, the Fire Polish engagement line is determined to showcase more sparkle than ever and has already been well received by jewelers carrying the new collection. For more information or any questions, please visit: firepolishdiamonds.com.